by Byron Bixler Every once in a while, a film manages to capture the ethereal. This elusive, utterly unquantifiable quality is commonly found in the raw earthiness of Werner Herzog films and the dreamily experiential cinema of Thai director Apichatpong Weerasethakul (Tropical Malady, Uncle Boonmee who can Recall his Past Lives). 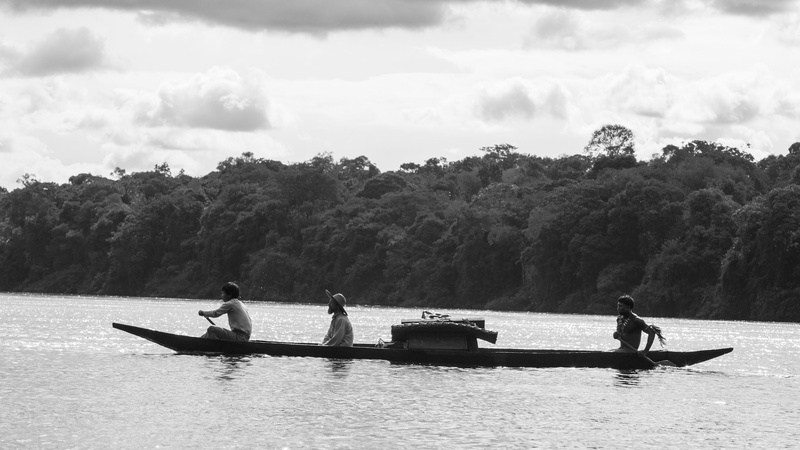 It’s also realized with unprecedented grace in Embrace of the Serpent, Ciro Guerra’s amazingly transportive lament for and tribute to disappeared indigenous tribes. Shot in nostalgic black-and-white (a formal choice that evokes the past), the film taps into a cycle of behavior and an understanding of the natural world that feels positively ancient. Deep in the jungles of the Colombian Amazon, a shaman named Karamakate lives in isolation. He’s the last of the Cohiuano people (a fictional amalgam of tribes in the region). Early in the twentieth century, a German named Theo (Jan Bijvoet) approaches Karamakate (played as a young man by Nilbio Torres). Deathly ill, the frail man is accompanied by Manduca (Yauenku Migue), a native dressed in western clothing who straddles the line between cultures. Theo comes to Karamakate on the belief that he can lead him to the rare and sacred yakruna plant, which is rumored to have powerful healing properties. The German, who presents himself as an anthropologist of sorts — lugging heavy suitcases of detailed notebooks — shows wearied humility and yields all authority to Karamakate on the quest. While initially wary of Theo, Karamakate agrees to accompany him down the river. Their voyage shows the painful signs of colonialism. After their detour to a lonely rubber plantation, they encounter a partially mutilated man who begs for death when he finds that his buckets of latex have been spoiled. Later, the group comes across a Catholic mission, where a lone Spanish priest presides over some local boys, forbidding them to speak in their native tongue and mercilessly beating them for any transgressions. Thirty years later, a second traveler — an American named Evan (Brionne Davis) finds his way to Karamakate (now played by Antonio Bolivar) and asks for guidance in his own search for the yakruna. Unlike the German, Evan is in perfect health and arrives without a guide. The American’s motivation is based in scientific inquiry — to Karamakate’s mild bemusement, he claims to have “devoted his life to plants.” Karamakate is now a much older man, forgetful and blunted by the increasingly ravaged state of the land around him. Once again, despite some initial uneasiness, Karamakate agrees and another expedition commences. The second voyage is more contemplative and plays like a twisted reflection of the first. One particular scene brings Karamakate and Evan back to the Catholic mission, where three decades have transformed the place into a bizarre cult, led by a deranged man (of indiscernible ethnicity) who believes himself to be the Messiah. The land has been drained of its resources and all morality and reason has rotted away. Guerra chooses to intertwine these two tales rather than stack one on top of the other and show the events chronologically. He delicately flits between them as each trip unravels, reinforcing the parallels and demonstrating how time has changed the region. One particular transition follows Karamakate, Theo and Manduca as they turn at a fork in the river. The camera takes the opposite direction, continuing down the river and watching the group’s boat disappear behind some trees before eventually running into Evan and the older Karamakate in their canoe. Later, the characters of the two stories are linked by the light of an abnormally bright comet passing overhead. These temporal bridges further the dreamlike notion of a synchronous past and present. Aside from the Amazon, the only consistently present character in the film is Karamakate — the last vanguard of a way of life rapidly going extinct. He’s a highly enigmatic figure. Both of his initial encounters with the foreigners find him in total solitude, standing at the edge of the riverbank, like a gatekeeper to a secret world. He rarely speaks in the daytime, but by the light of the campfire, Karamakate opens up, narrating the stories and belief systems of his people (a people suggested to have been wiped out by colonialists). It’s ultimately the remote hope of somehow reconnecting with the Cohiuano that motivates him to help both Theo and Evan. The director has stated in interviews that he wanted this film to be more than an attack on colonialism. Embrace of the Serpent goes beyond this critique by allowing the residuals of that destructive enterprise to subtly color the background. There are no “great white conqueror” types swaggering about, placing their boots on the throats of the natives. We get hints at their presence (in vignettes like the one at the rubber plantation), but the true focus is on exploring the perplexing Colombian Amazon (a region that Guerra notes is vastly underexplored). This is not merely another diminutive tale of the “noble savage.” Guerra’s approach to portraying a dying culture involves immersing the audience in a visceral sense of place. The Amazon is presented as a living, breathing entity, embedded with the spiritual seeds of an ancient way of life. By focusing so heavily on the age-old marriage of the spiritual and the physical, the director leaves us with a haunting, transfixing portrait of what was truly lost. The story’s events are enclosed in a heavy mysticism that permeates the surrounding environment and nearly every conversation. Aside from the onslaught of colonialism, a central theme concerns the importance of dreams and their connection to enlightenment and the spirit world. Karamakate talks of how white men must be taught to dream and how dreams hold the key to salvation. He also speaks about creation myths, alluding to the symbol of the jaguar and referencing the river as “the anaconda’s room.” On more than one occasion, these words come to life in the form of surreal, slightly unnerving imagery that may or may not coexist with the characters. Embrace of the Serpent affords us the rare opportunity to peek into the past. Here, the ethereal derives from inscrutable jungles and murky waters — an engrossing expedition into the birthplace of dreams (and an acknowledgement of the devastation wrought by real-world nightmares).